Well, seeing as my site is called Crochet Leaf, I'm very glad that at last I seem to have created a few leaves for you to crochet! 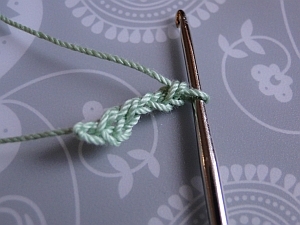 NB: when working into a chain stitch, work under two loops. Here is the written pattern - pix below! Step 1: ch 3, dc into 3rd chain from hook. Step 2: ch 3, sc into 2nd chain from hook. Repeat from * to * for pattern. Finish with 1 ch and tie off. Step 1: ch 3, tr into 3rd chain from hook. Step 2: ch 3, dc into 2nd chain from hook. 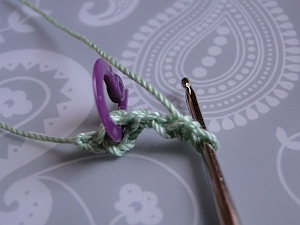 Start with a slip knot, then ch 3, dc (UK tr) into 3rd chain from hook. 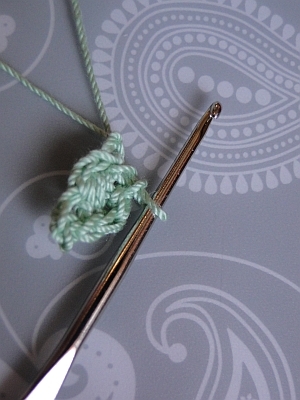 Remember that when crocheting into these chains, we insert our hook under two loops of the chain. And here is your first leaf all done! 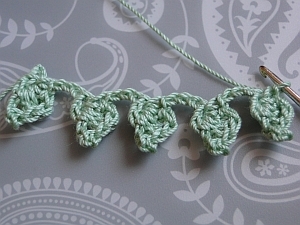 The leaves sit straight - or curve rather well, either around a corner or just by themselves, which could turn this braid into a rather pretty little necklace! 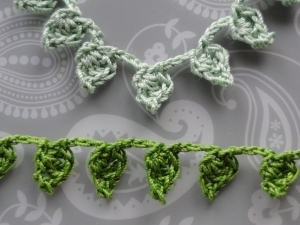 You could also start the pattern with a length of chain, then after completing your last leaf, work another length of chain, so that you can tie the ends onto something. 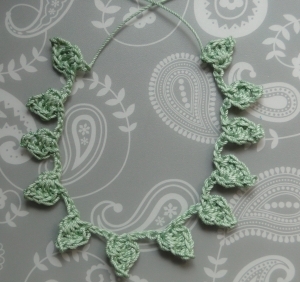 Here's another idea - combine leaves and flowers along the chain, just as Eleonora from Coastal Crochet did for her visit to Glastonbury festival!